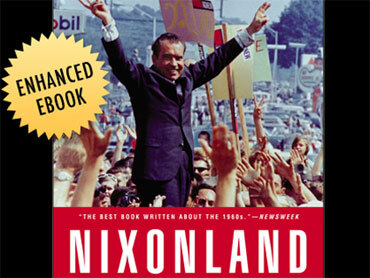 The bestselling "Nixonland" has been re-released in a partnership as an "enhanced" book which will add visual elements into the original text. The new version will include 27 historic video segments from CBS News, placed within the book to add visual context to the text. It will also feature an original interview by CBS News Chief Washington Correspondent and "Face the Nation" anchor Bob Schieffer in which he discusses the book with author Rick Perlstein. The re-release comes from a partnership between publisher Scribner and Simon & Schuster Digital and CBS News. "Nixonland" was first published in 2008, and examined the rise and eventual fall of Richard Nixon over its 896 pages. In the enhanced version, readers can watch videos of the historical events discussed throughout the text. Perlstein also offers analysis of critical moments from the 1960s and 1970s including the Kennedy/Nixon debates, the assassination of Martin Luther King Jr., Watler Cronkite's on air commentary supporting the withdrawal of U.S. troops from Vietnam and Nixon's role in the Watergate affair. Visual elements involving each of those events, from Cronkie's broadcast to the public's reaction to King's assassination, are included. In their interview, Schieffer and Perlstein also discuss the potential political lessons from "Nixonland" and their effect on events today. The enhanced version of the book costs $15.99, and is available at Apple's iBookstore and Amazon's Kindle store. The book cannot be read on the Kindle's e-reader, but can be read on the Kindle app on an iPad, iPhone or iPod Touch. Simon & Schuster is owned by CBS Corp.